Benjamin Clay first appears in the Indianapolis City Directory as a laborer in 1867. He and his wife, Zina Fishback Clay were born in Kentucky. His son Richard was born in 1868, the second of seven children, all born in Indianapolis. All of the children attended school. Richard went through the sixth grade. In 1892, Richard Clay married the first of his three wives, Minnie Cummings. Both were 24 years old. She has also been born in Indiana, but could not read or write. In the 1900 census she had given birth to three children and one was still alive, but did not appear to be living with them. He was working as a laborer and continued to work laboring jobs for the rest of his life, including a coal yard, a grocery/bakery and a foundry. In 1901, Richard testified at Thomas Ray Allen’s pension hearing that he had heard him say that he suffered from various ailments. That same year he married his second wife, Hattie Elkins. I have Elkins cousins, but was unable to find a connection.He was 33 and she was 22. They had no children. Richard and Hattie continued to live in rental houses. In 1921, Hattie died of uterine cancer that metastasized to the abdomen. She was 40 years old. Her husband was the informant and gave her parents names. She was buried in New Crown Cemetery. In 1929, sixty one year old Richard married forty year old Nettie Kelly, his third wife. She was born in Georgia, was literate and worked as a servant for a private family. By the 1940 census, Richard was 72 had not worked during the past year. She had worked as a home aide for 32 weeks during that year. They rented their house and did not own a radio. Nettie had completed the 2nd grade. She was the one who gave the family information to the census enumerator. In February of 1948, Nettie Kelly Clay died of a cerebral hemorrhage. She was buried in New Crown Cemetery. Richard was the informant. He did not know her parent’s names. The undertakers were Jacob Brothers Funeral Home. I noticed that they were undertakers for quite a few of the people I am writing about. 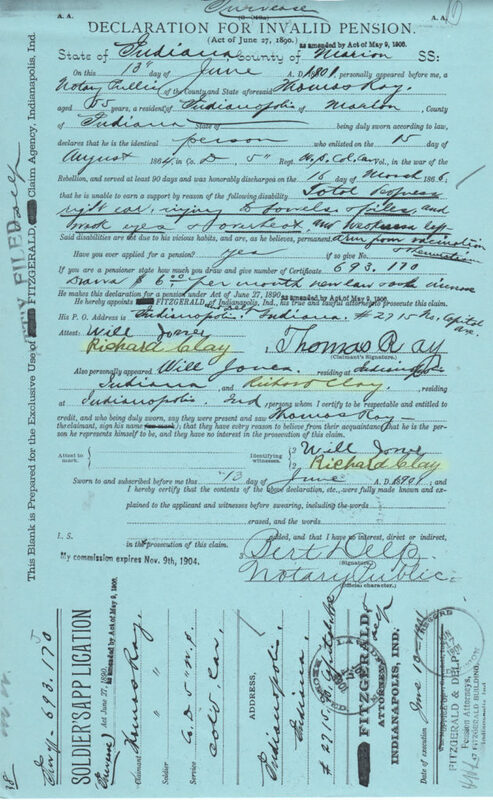 In January 1941 Richard Clay applied for social security benefits. He gave his birthdate as 1858 and his birth place as Bowling Green, Kentucky. Richard Clay died at home of stomach cancer on October 15, 1951. His age was listed as 93, although he was closer to 83. He had been seeing a doctor for six months. His nephew, Gilbert Hall was the informant. Contradictions in researching Richard Clay. In the earliest records, 1870 and 1880 censuses and the record for his first wedding, his birthdate was given as 1868. In the 1900 census his birthdate was given as 1855. In the 1910 census his birthdate was given as 1860. In all of these records, his birth place is given as Indiana. In 1920 his birthdate is again given as 1855. In 1930 his birthdate was given as 1880. In 1940 his birthdate was given as 1858. In his social security application his birthdate is given as 1858, as it is on his death certificate. On all of these records his birth place is given as Kentucky, Olan County Kentucky or Bowling Green Kentucky. His parent’s names are consistent. I found the information for this post on Ancestry.com and in the Pension File of Thomas Ray Allen. 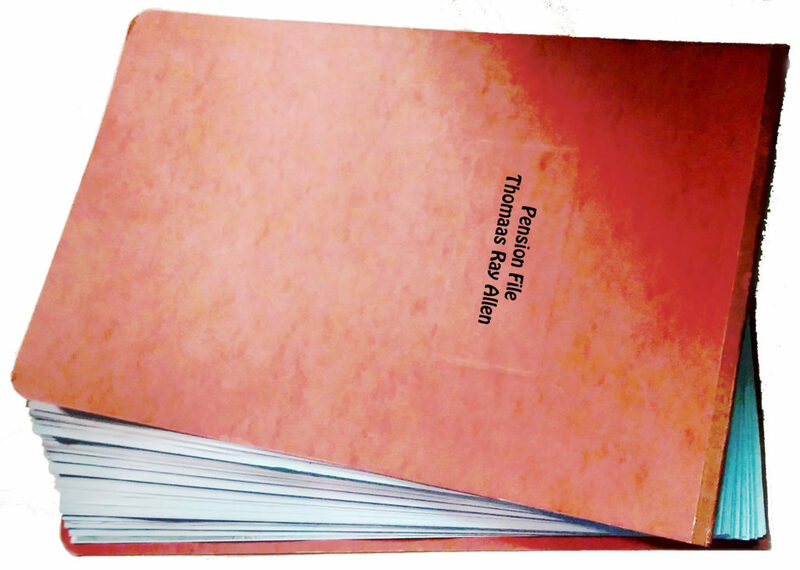 With a file that size it is no surprise that you are able to find so many connections to Thomas Allen. I see Richard and his first wife had three children. Does the census showing one to be still alive tell you whether it was a boy or girl? There is just a box to put how many children the mother birthed and how many were alive when the census was taken. At first a “3” was written in the box and then it was scratched and a “1” was written over it. Or maybe it was a skinny “0”. Unfortunately, I don’t know who the wife’s parents were so I couldn’t look there to see if they had a grandchild living with them. Thank you for visiting my blog Kristin. I’m blown away by the details you’ve found. This is the first of your posts I’v read, so I’m sure I need to trace back to get the whole story. Both sets of my grandparents came to India in 1947 after the partition — when Pakistan was carved out after the British left. I would love to trace my roots too. But political boundaries make it rather impossible. Thank you for visiting back. The first thing to do when beginning to research your family is talk to the oldest living members about what they remember about their parents and grandparents, where they lived etc. Sometimes they may have saved things like birth certificates or other documents that help. I wouldn’t have known where to begin if I hadn’t gotten basic information from my mother and grandparents and aunts and uncles! Good luck. I used to belong to a group that read South Asian literature, mostly Indian but some from Pakistan and Ceylon. We read a few books about the partition. I learned a lot in that group. It was online, Sasialit, I think it was. Thank you for the tips Kristin. And I will check out the link you mention about the partition, too. I’m not sure if the group is still functioning. Good luck! The Elkins connection is tantalising. If not the Elkins connection then how did Richard know Thomas I wonder? After reading so many testimonies, I’ve come to the conclusion that someone read what we see to the witnesses and asked them if that was what they knew or something like that. They may well have known about his pile and bowels because so many of his friends seem to have been in bad shape too and they might have sat around talking about their aches and pains and why they couldn’t get their pensions raised. Too bad they don’t list how he knew them! You’ve got a lot of detail there which should hopefully help even if contradictory. Incredibly detailed and well researched post. If Richard was born in the country and no records were kept, it’s possible that no one was sure of his exact birth date — including Richard himself. I have a similar issue with birth dates for my Irish immigrant ancestors — they are all over the place.